Why tf luffy is carrying stones? Don`t worry. I’m making some muscles. The fck was that, why is there a kid? With the ruckus about the return of Kozuki Clan, we will probably see Orochi before the year ends. WHO IS THE MAN LUFFY AND KID FOUND INSIDE HIPPO? When they shown how shiki escaped from impel down , Magellan was assistant warden. He was reporting to higher authority. So king might have been in impel down. As per X drake prediction King and Queen might be colleague from impel down. Morley is the one who is capable of creating that hidden room so maybe Morley and Queen are both prisoners and former colleague. psg vs liverpool… live noe.. its gonna be good..
does psg need to win so they can advanace? what about inter? psg were on fire though,,, they played like how epl clubvs play i.e they played how liverpool does against opponents..
Maybe Kid was translated as child ? If that Kid, is indeed a child, not Eustass, then I want to know from someone who has access to the official English translation if Kaido meant Kid as a child or Kidd(Eustass Kidd) who has COC same with Luffy. After saving luffy from sea monster, few years later Shanks ate a DF called mind mind no mi. OK guys, now I can confirm Spoiler is real. Here more details. – In the cover we can see Law and Chopper studiying in a library with a turtle and a bird with glasses and hats. – Usopp sees in the street a samurai with the mark of Kozuki Clan, and gives him a paper with Kinemon draw (2 birds, a flame, a snake…) without the samurai realize him. – Penguin and Shachi do the same with another samurai with the mark of Kozuki Clan. We can see at leats 11 samurai with the mark of Kozuki Clan. – Nami and Shinobu are spying 2 samurais but they discover them, so Nami and Shinobu escape thanks to Shinobu’s kite. – In the prison, slaves are carrying big square stones for only a little piece of meal. – Luffy and Kid moves a lot of gigant stones alone, even with Kairoseki handcuff. They have a gigant bowl with food. – Hippopotamus guard appear. He’s an hippopotamus with a guy with hippopotamus face in the mouth… It’s pretty funny. – Hippopotamus guard is furious with and old man. – We can see Caribou, he’s one of the prisioner. – Hippopotamus guard swallows Luffy and Kid, but they defeat him from inside. – Luffy and Kid come out. Luffy holds the old man in his hands. We cut back to Amigasa Village where Nami, Raizo and the rest are. 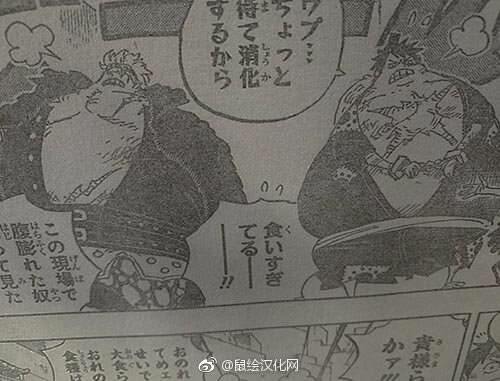 They’re chatting with each on how they will save Luffy other from onigashima. then they feel this weird earth quake..
all the trees and buildings behind them turned into homies. Big mom has something in one hand, Napoleon in the other. prometheus floats beside her. Big mom: Where is straw hat luffy?? and where is ZUES?! Sanji: wait who’s that she’s holding?! Brook: THATS ZORO -SAN AND HE’S BLEEDIG HEAVILY? What do you seek with that fake but creative spoiler? huh it did sound wierd. Is Caribou the prisoner who killed the guard with a fish bone? Do you think that Logia that has haki ability can counter his/hers opponent’s haki? Like Sabo vs Bastille. Sabo didn’t bother to dodge his cuts. Could Sabo feel that Bastille couldn’t control haki or was Sabo’s haki so strong, that he knew that he can counter Bastille’s haki? Or was that just rev army’s intel so good that Sabo simply knew that Bastille has no haki skills? so its pretty clear now kidd n luffy are main rivals… only kidd has shown the will and recklessness comparable to luffy..
n u need not be a d to be important ,look at wb , he was no d, oden no d, rayleigh no d… law was not even meant to be very imporatnant only kid d was, imagine the importance of kidd coz theses were odas words himself but again u are a blind admiral supporter i dont expect much from u when it comes to ur biases , when even manga cant convinve you… bb b but he is not a d .. m like wtf does that have to do with anythng .. rogers biggest rival wasnt a d…he was a newgate..
but noen of them became pirate king. garp regarded wb as ruler of the seas,, wb was easily greater than garp and his d whtever..
and who does law have in j=his family if u wanna talk about family… bm has the strongest family… not law or garp..
Law’s fruit is Worth as much as a yonkou Bounty. more like didn’t train his fruit properly. what fruit woudl you rather have? great defense but weak offense like marco, balanced ofense defense liek logia, or full ofense and no defense like wb? fire logia is really cool n ice logia aswell…. n kings haki.. id want that too..